Renee de Winter stands out at the Academy of Tildor. She’s the only female soldier, and she is of high birth as well. A sense of morality and duty drove her from her family seat and a crime-lined inheritance to enter the grueling training to become a Cadet of Tildor – the country’s elite soldiers who are the only force not tainted with blood during the ongoing struggle between two crime families who are attempting to oust the young king from the throne, and assume power of their own. Renee struggles with the training. Her spirit is willing, but her body barely manages to keep up with her larger, stronger male counterparts during brutal sword training that leaves her bruised and bloody. When Savoy, an infamous young commander is called away from active duty to train the young cadets, he teaches Renee to rely on her speed and agility rather than try to match her male counterparts with strength. Political unrest and the taint of illegal drugs reach even into the hallowed walls of the Academy, and Savoy – whom Renee admires fiercely, is kidnapped and sold into gladiator slavery. Along with her best friend Alec, Renee must free Savoy not only to save his life, but to expose the truth as well. 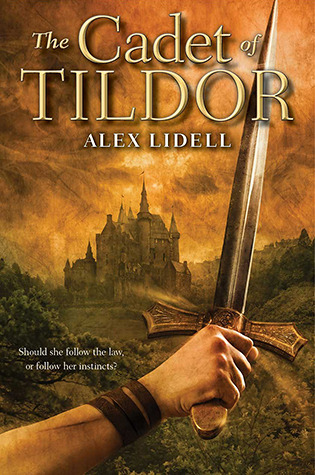 CADET OF TILDOR is a relief from the stereotypes in so many ways. Renee is not gorgeous, she does not have superhuman strength or an unbelievable reserve of strength. She struggles. She bleeds. She sweats. She questions herself. While she is loyal to Savoy and admires him, she is not in love with him, (although she’s not above admitting that he’s attractive), and he’s not in love with her. Even more refreshing – boys and girls can be friends without unrequited love tossed into the mix.